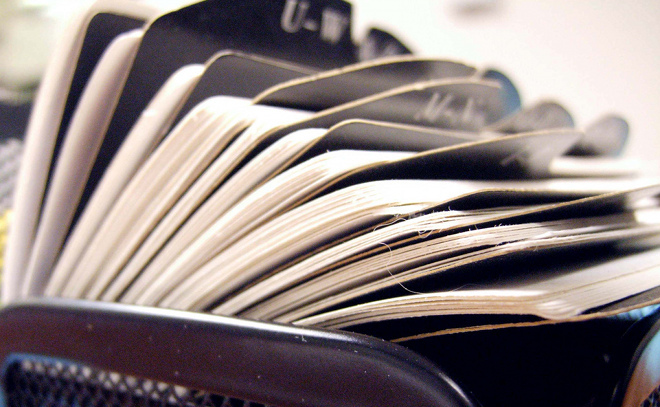 Business cards are an important part of life, helping us quickly swap contact details and turn a brief meeting into a valuable long-term contact. The thing is, business cards are so 20th Century. There are now a number of companies vying to replace them with far more tech savvy solutions. If you’re tired of getting having to take a box of cards around wherever you go, here are five solutions to try. One of the highest profile replacements for business cards out there, Bump is an app for iOS and Android that lets users exchange their details between devices by simply “bumping” them together. 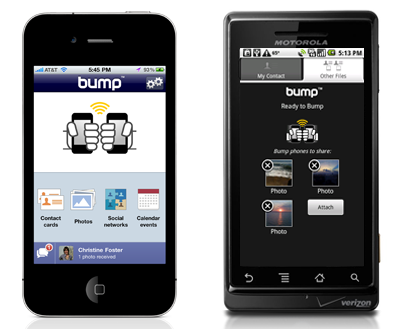 Beyond simple contact information, Bump allows users to share pictures and calendar events, and connect to other people’s Facebook, Twitter or LinkedIn accounts by tapping their devices together and selecting which information to transmit. The service lets you set up multiple profiles for different social settings and it works cross-platform, meaning that an iPhone can ‘bump’ an Android device, for example. This solution couples a good-looking Web-based “electronic business card” with a Bump-like wireless contact sharing service via its app for iPhone and mobile website for other platforms. Contact cards can be shared wirelessly between phones, and you can even send your details to people who don’t use My Name Is E using the email option. Beyond basic phone numbers and email addresses, the service has fields for over 50 social services including LinkedIn, Twitter, Facebook and Skype. Friend requests can be sent directly from the app in some cases, too. 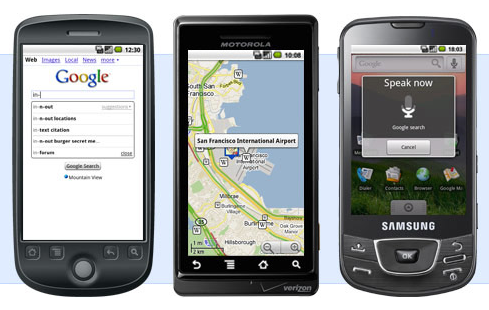 Location tagging allows you to see exactly where you made contact with someone – useful if you regularly travel. Jumpscan places all your contact information into a single QR code image. Anyone with a QR code scanning app on their phone can take a photo of your code to be taken directly to your contact information. You can either print out your QR code, with the advantage that you only need one copy of it to share with many people, or you could always keep an image of your code on your phone for people to snap from the screen. 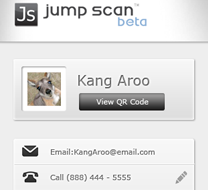 Jumpscan is currently in beta, open to 50,000 users so if you want to try it, jump in quick while spaces are available. Another competitor in the space is SnapDat. Currently only available for iOS, the idea is that to pass your details on to another user, you just ask for their SnapDat username and it’s sent straight across to them. 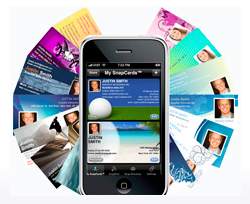 SnapDat differentiates itself from the competition via its 40 electronic (virtual) business card designs, which it hopes will help convey your personality and individuality more than a plain vCard. That said, you can send your details to those who don’t use the app via an email option which attaches a vCard containing all your details. While it won’t help you do away with your own business cards, Google’s super-smart Goggles app for iPhone and Android can help you deal with other people’s business cards that you receive. Simple take a photo of a card with the app and, providing Goggles recognises it as a business card, you’ll get an option to save the information directly to your address book. It’s impressive stuff, although if you find it’s not giving the results you expect, another option is ScanBizCards which does the same thing, but for iPhone only.